Foe texture in the shade garden Hosta sieboldiana is hard to go past. Large puckered foliage heart shaped and heavily veined. And if that not enough, their are two varieties of this popular large hosta. 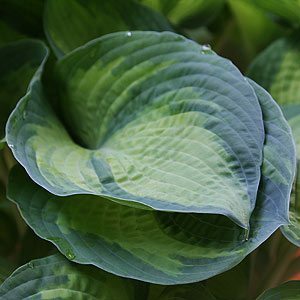 Like all hostas this is a shade loving clump forming perennial, Hosta sieboldiana is particularly attractive and when in full growth is a great specimen plant. The two main forms ‘Elegans’ and ‘Frances Williams’ (see picture right) are both wonderful plants. H. sieboldiana ‘Elegans’ has deep smokey blue green leaves, if will flower in spring with white flowers, however the foliage is the main attraction. The one that we grow is H. sieboldiana ‘Frances Williams’, is more of a mid green with paler margins and markings. Both varieties are tallish growing types reaching a good size, nearly .5m in height, however it does grow well in containers as well as the garden border. The foliage is heavily ribbed giving it a distinctive look in the garden. A humus rich, moist but well drained soil is essential, protection from frosts, and more importantly snails, is essential. Fertilise well and you will find that the foliage of Hosta sieboldiana becomes a little tougher and a little more resistant to snails. You can propagate both varieties by division, best carried out in late winter as the plant comes back from dormancy. Choose a position with afternoon shade or good dappled shade. Dig the soil over well adding some well rotted compost and a little aged cow manure. Plant H. sieboldiana giving though to it mature size, back a little from the edge of the border. Height – Generally to around .6 metres, sometimes taller. Spread – This is a clump forming perennial and will happily spread to around 1.5 metres over time. Soil – Humus rich with moisture. Although we rarely water our garden grown specimen. Hostas grow well in containers as long as they are in the shade. Use a premium potting mix and fertilise every spring. We suggest using some copper snail and slug tape as a barrier, two bands a little apart 2/3 of the way up the pot.